When it comes to moving, you will need some good quality packing and wrapping materials to protect your furniture, personal belonging, all your fragile and precious items. If you have not moved before or if you have no experience in relocating you probably do not know how often people lose their invaluable things only because they did not take their time to pack everything properly. Before you start packing you have to know that most of your mugs, plates, paintings, ornaments, cameras, spectacles and other gear are very easy breakable. However there is no need to panic! There are many good quality, very protective packing and wrapping materials in Leeds and also available on the market, even online, that if correctly used will prevent you from a real disaster. 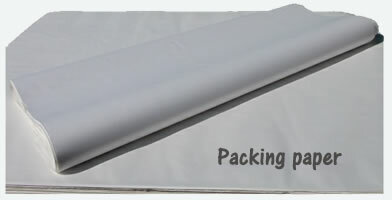 Packing paper is one of the most helpful and needed wrapping materials when preparing an international removals. You can use it literally for everything, starting with your kitchen stuff like plates, china, porcelain, mugs and pots ending with more private items like delicate picture frames or wine glasses. Packing paper comes in many different colours and sizes. The most common format is a square 100cm by 100cm. Off course there are many different sizes available that you can order and it will depends on what you are going to pack. Please note that the packing paper can by supplied in any dimensions, colours & printing. However the availability will depend on the value of your order. One of the best ways to protect your furniture during the house removals is to use transit blankets. Protection covers have been commonly used for ages by logistics, freight forwarding as well as removal companies to provide an absolute protection for table, bookcases, desks, bed frames, TV stands, chests and other household furniture when in transit. Blankets are made from a recyclable wool allow to avoid friction between much bigger, harder pieces of furniture and protect them against the damages, vibration, knocks and scratches that may be caused by items pressing, pushing and rubbing against each other. Furniture protection blankets are relatively cheap and effective and that's why a lot of students and other people have been taking advantage of using them to secure cargo not only on the vehicles while in transit but they also use them for long term protection of goods in storage. 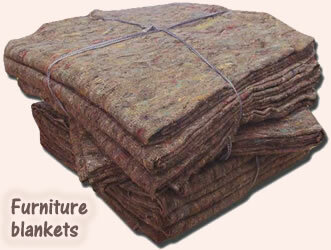 Blankets can be used to protect your goods in the loft or garage from dust.